This is a port of Eggerland 2. For other games in the series see the Eggerland category. 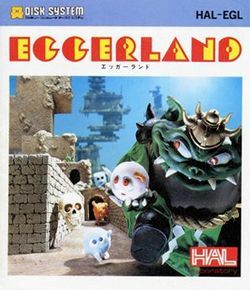 Eggerland is a puzzle/strategy game developed by HAL Laboratory for the Family Computer Disk System in the beginning of 1987. The Eggerland series is better known outside of Japan as The Adventure of Lolo series. The game is often referred to as "Syodai" (初代), or the "first one". The game is a port of "Meikyuu Shinwa" (Eggerland 2; lit. "Labyrinth Myth") for the MSX2 Home Computer System with updated graphics and different music. Furthermore, in this port the location of some special rooms was swapped, and a final boss battle was introduced. In this Eggerland, Lolo must navigate his way through a non-linear series of rooms, the majority of which occupy a 10x10 arrangement along the main floor of a castle. Many rooms have more than one exit for Lolo to choose from, and a map can be collected along the way to provide the player with information about where he or she is, and what rooms have already been visited. Secret entrances to hidden chambers must be found so that keys can be collected, enabling the player to explore deeper into the castle. Peace lasted for many years in the beautiful realm of Eden Land. The people were at peace and everything was well. However, one day the incarnation of destruction, King Egger, came from the underground realm of Eggerland seeking to destroy the peaceful realm and claim it for himself. King Eden dispatched Lala to the God Inphony to seek his help, and Inphony gave her Inphonit Power and five keys to open the gate of evil. Four gods obeyed Inphonit and joined her, but Egger caught her while she tried to stop him and concealed her in his underground labyrinth of Eggerland. Fortunately, she succeeded in concealing the Inphonit Power, and Five Keys and Four Gods in the land of Eggerland. Lolo, prince of Gentle Land, heard the news that Lala had been captured and immediately ran to Eggerland to rescue her. This page was last edited on 12 December 2017, at 16:17.